"Say something I haven’t heard before"
"We make a machine that turns water into money" they say "Wow, how do you do that!" 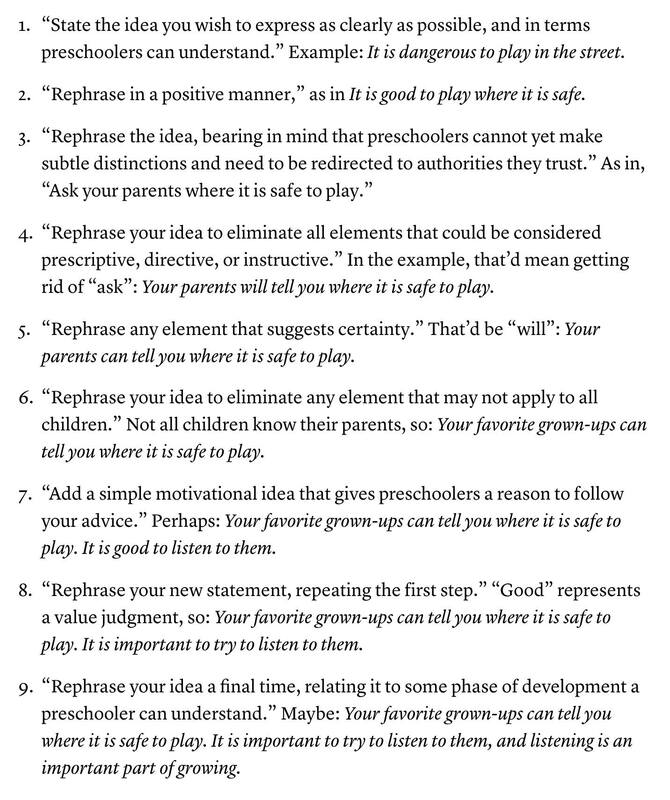 Speaking tips: Warm up! Breathe! Mark Suster on 1m "clocktail party pitch"
https://pitchbook.com/ Databases of VC firms. Criteria lookup for early a round tech investments in NYC area. Pitchbook has an intro process, the $5k means they help you connect. He says you need a 30s pitch and a 2min pitch and that's it. How big is the market: "You know Airbnb might say, How big is the hotel market? How big is the vacation rental market? How big is the online hotel booking market?" Traction: We launched in January and we're growing 30 percent month over month. We have this number of sales. This amount of revenue. This number of users. Team. How many founders, how many engineers. How long have you known each other. You're all working full-time. Big ask. Safe, discount, amount. SEIBEL: Tell me something that I don't know. Something that the biggest players don't understand. Or don't do well. ... And I need to AHA. You can see whether it's happening when you're saying it. That's why I like two sentences so you get in and out fast. So if I look at you and I'm like, "Huh." Then it's ok. You nailed it. If I look at you and I'm like, "I already knew that." Then you didn't nail it. If I looked at you and I just don't understand what you're talking about you definitely didn't nail it. SEIBEL: Where founders get tricked on how you will make money is they say, "Well - we're going to run advertising. Maybe some virtual goods. We're going to figure out how to this. And maybe this. And maybe this." Well now you're saying nothing. Now you've told me you have no idea how you monetize this. his was a check mark that I just wanted to write. Instead I am writing a big question mark. Figure out the story. Why are we going to matter in the future? What is it about our product or opp that tells a stort the VC might care about? This might mean getting PMF, it might mean Growth, could mean a lot of things. Find the right investors. 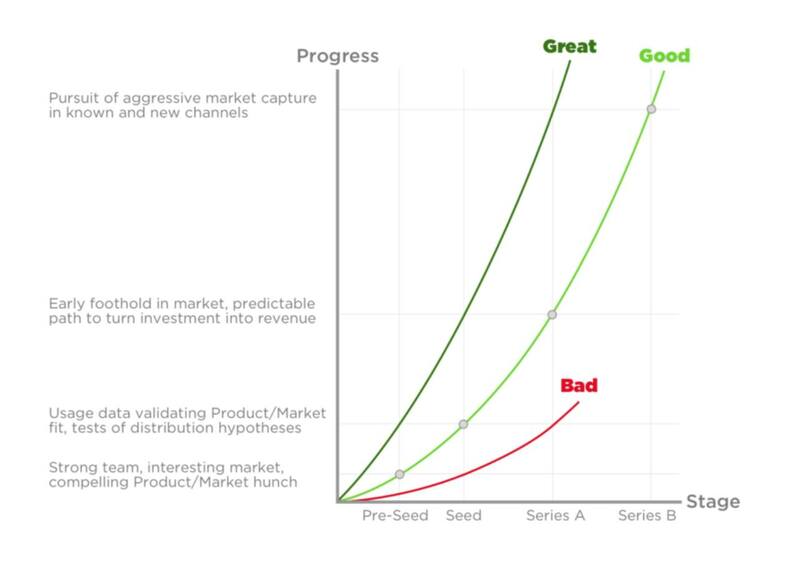 Do research, talk to other founders. Get Organized – do your homework, create your spreadsheet, get a list of everyone you’re gonna talk to or reach out to or get intro to. Meet and pitch all of them (and more) until you get a yes. Refine, iterate, get better. Eventually you meet the right investors. Glad you were able to watch! One of my favorite early-stage investor decks is Airbnb’s. While they for some reason did not include a team slide (this is now a must), the format is otherwise spot on, in terms of the standard for what investors expect these days. They also make a great use of graphics and overall simplicity. Important to remember that an investor only spends about 45 seconds (or less) going through most decks. DUSTIN: Nobody told me this! 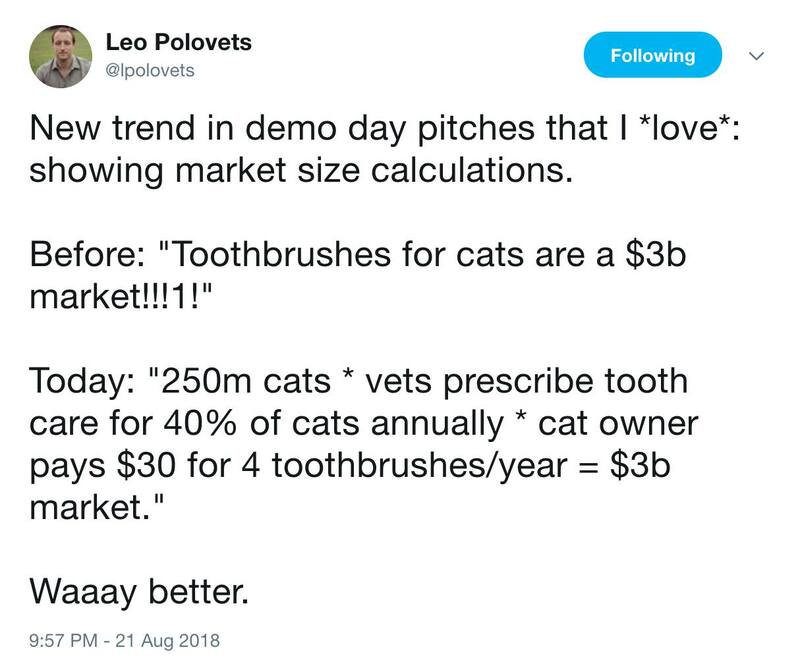 This is why TAM has to be a formula like "250m cats vets prescribe tooth care for 40% of cats annually cat owner pays $30 for 4 toothbrushes/year = $3bn market". 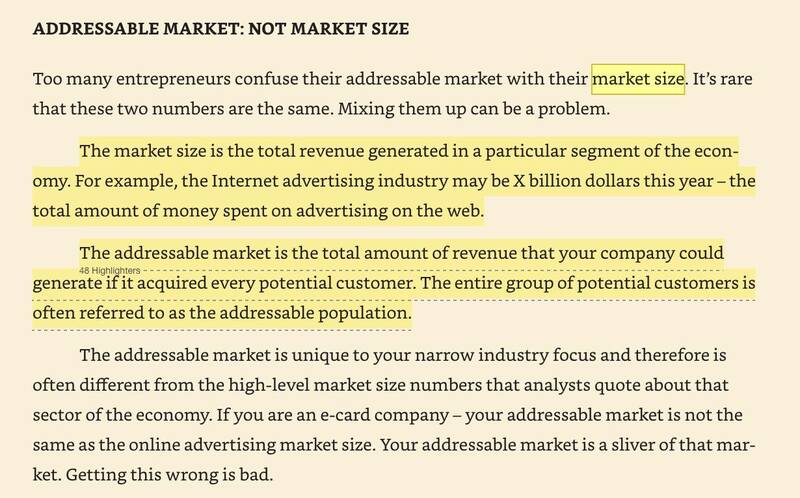 That's not the same thing as market size! Even the VC I am quoting called it the wrong thing.